The Ocular Oncology Clinic at the U-M Kellogg Eye Center provides advanced care and cutting-edge diagnostic capabilities and treatments for children and adults who have been referred for management of ocular tumors in and around the eye. Under the direction of Hakan Demirci, MD, the clinic provides a depth of experience and level of care available in only a few centers across the country. 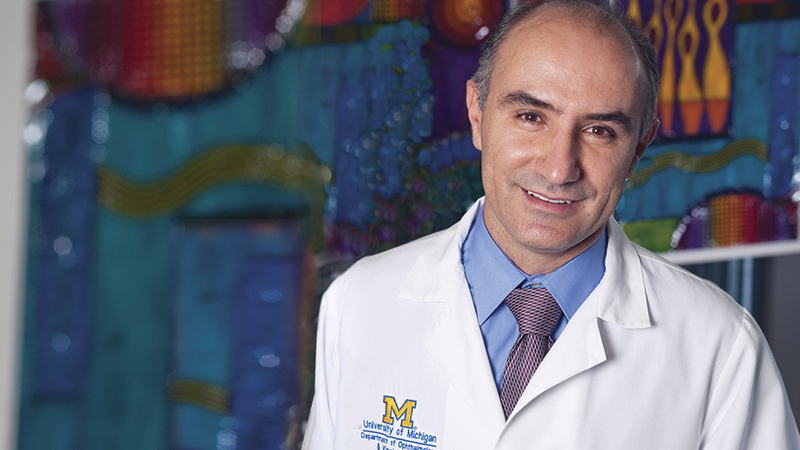 The clinic collaborates with oncologists from U-M’s highly regarded Rogel Comprehensive Cancer Center as well as other U-M medical services to bring our patients the best and most comprehensive care available. Thus, in addition to seeing ophthalmologists, our patients will see specialists in radiation oncology, melanoma, pediatric oncology, and others as needed. Our physicians and staff are dedicated to helping patients deal with the many concerns that arise with a diagnosis of eye cancer. They will be pleased to answer your questions, identify useful resources, and coordinate appointments at the Kellogg Eye Center and throughout the U-M Health System. Most patients come to Ocular Oncology through physician referrals. We work with referring physicians to achieve the best possible outcomes for their patients. We are always available to discuss a specific situation and encourage you to call 800-962-3555. The Ocular Oncology is dedicated to providing multidisciplinary care and treatment for patients with tumors of the eye. Our team of physicians includes specialists in retinoblastoma and other children’s eye cancers, as well as adult forms of intraocular, conjunctival, adnexal, orbital and periocular tumors. If you are a physician and wish to make a referral, here are several ways to contact us. If you are a patient, please feel free to share this site with your physician.